DISCLAIMER TO BRAND MANAGERS: I’m not aware of your official brand messaging and don’t have time to look it up, so if I’ve got it wrong know that this is just one consumer’s take. Discovery Channel – Quility programming that covers content others don’t. They also do a good job with brand extensions and how they touch consumers. LIVE’s lessons here are first, quality is always important in driving sales, and second, to develop entertainment for consumers that are being under-served. The History Channel- Again we see quality in their programming as a key to the network’s success. Also, many are just fascinated by history. LIVE’S lessons from History would be to create more programs like the live Titanic exhibit that combine the past with a live emotionally engaging experience. Google – First to market, easy to use, consistent, and almost everyone has access…this is a great brand. Why not a Google for LIVE? There really isn’t anything out there that is reliable, consistent, easy to use, etc. Craftsman – You can rely on your tools… Craftsman is a great brand because they make a quality product at a good price point that lasts forever. My idea here is to hook-up with Sears to produce the ultimate Handyman/DIY consumer show. Do-it-yourself is big in a down economy! Sears, please call me! I already have the deck done. Branded Live Entertainment at its best!!! Sony – You’re staying home more which means more time in front of your television. Your Sony TV works great. So does your DVD player. LIVE should be able to create quality products that you can rely on to entertain you…but we don’t always. Rubbermaid – They make your waste basket and the containers you use to store your food. In other words, Rubbermaid makes products that you need… that last. Figure out what consumers and fans need and produce that show. Observation works a lot better than research groups in for this. Barnes & Noble – Don’t really get this one. Don’t get me wrong, I love the brand and read a lot. It’s just not clear why they would be so high in consumer’s minds. As for an idea, LA has a very successful book fair at UCLA every year sponsored by the LA Times. Newspapers are looking for anything right now. Here is your chance to partner with them. Whirlpool – We need washers, dryers, and refrigerators. That’s not going to change. Whirlpool makes good ones. No ideas here for LIVE…yet. Clorox – One bottle has so many purposes at such a low price. One must be careful not to try and be all things to all people…especially in Live Entertainment. Festivals are the LIVE version of bleach. Lots of entertainment for one price. M&M’s – If you are hungry and standing in front of the candy rack, M&M’s look like the best value. You get more than one M&M, they come in different colors, sizes, and packages, and now you can even customize them. Ever been in an M&M’s store? Crazy!!!! Tylenol – It’s the choice of hospitals. That’s enough for me. They even made it through the “Tylenol Scare” and managed to invent a safety package that everyone else had to copy. If you are in LIVE, find who is at the “white hot center” of your show theme and get them to endorce you. If it is doctors for Tylenol, who is it for you? Duracell – High-end electronics (like those for products that keep you alive such as pace makers) come with Duracell batteries in them. See above. Quaker – In tough times, people turn to their health. Quaker Oats are healthy and inexpensive (I’m assuming they aren’t talking about the motor oil company). How about producing a health related event? Before Ben Silverman joined NBC, I pitched him and his production company on a “Biggest Loser Live” concept”. Now might be the time. Pillsbury – Easy and quick to make, good price points, and an iconic lovable mascot. Pillsbury saves the over-scheduled consumer precious time. You should be using ever means at your disposal to break down any barriers for consumers to finding your event, buy tickets, and attend. Lowe’s – Surprised that they are on the list and Home Depot isn’t, but hey that’s consumers for you. I would pitch Lowes the Handyman/DIY show I want to run by Sears. Black & Decker – Tools again. Reliability. LIVE, see above on Handyman/DIY…again. KitchenAid – They make appliances you need with good design…and have Kitchen in their name. In LIVE, food shows and festivals are continuing to grow. The Agency Group Events & Entertainment has two different concepts we are producing in 2009 alone. Campbell’s – Soup makes for filling, inexpensive meals. Campbell’s has been around forever. Time to start a food show. Maytag – Years of advertising the same message of “the lonely Maytag repair man” seems to have paid off. What’s your message? If you are still marketing your shows line-up (product attributes) you are doing it wrong. Market the experience! Kenmore – One would think with Craftsman so high on the list that Kenmore would be higher. Again, with consumers… Anyway, Bruce Springsteen is our Kenmore. So is Sesame Street Live and Disney’s Broadway shows. Like Kenmore, you know the brand and the experience are going to. Keep the ideas flowing. During trying times like these, great things can happen. Talk with you soon… and please visit our new company website @ http:www.theagencygroupevents.com. Also don’t miss the Customer Service Panel at the Concert Industry Consortium on Friday, January 30th at 3:30 pm in the Santa Monica room at the Hyatt Century Plaza Hotel. Today’s LiveWorks News starts with a few sidebars. First, I would like to apologize for the old newsletters that seem to get sent to you for no reason. I have no idea why this is happening (usually when I don’t write for a few days) and am trying to get to the bottom of it. Second, I’ve been getting emails from LiveWorks News Subscribers asking why I don’t write more, and others asking why I write “every day”. For the record, since October 20th when the newsletter started back up, there have been 16 posts. For those of you that would like more info and more interaction than the newsletter is currently providing, please follow my updates on Twitter… http://twitter.com/jimlewi. Final bit of housekeeping relates to interaction. Meaning it would be great if you could give feedback on the LiveWorks Newsletter. Tell me what you would like to see covered. Submit an article of your own. And if you like what you’re reading, please pass the LiveWorks News on and encourage others to subscribe. Now as a friend of mine once said, “on with the countdown”. If you look back at the 16 LiveWorks Newsletters, there are a few themes that seem to pop-out at you. Two of them are; making the most out of the current economic crisis by thinking of ways to service your customer, and partnering with brands vs. sponsorship (Branded Live Entertainment). Below are great examples of people like you, working in our business that are taking action today rather than trying to “play it safe”. Congratulations to Goldenvoice. Please make sure the whole world sees what these guys are doing! They actually care about fans. There is of course a No Refund policy on deposits on tickets, which is a win-win for Goldenvoice. Of course they want the fan to show-up so they can make money on parking, food & beverage, merch, etc. But if for some reason they can’t, Goldenvoice still has their deposit. Nice Job! While flipping through BrandWeek over the weekend, I came across the ad pasted below. 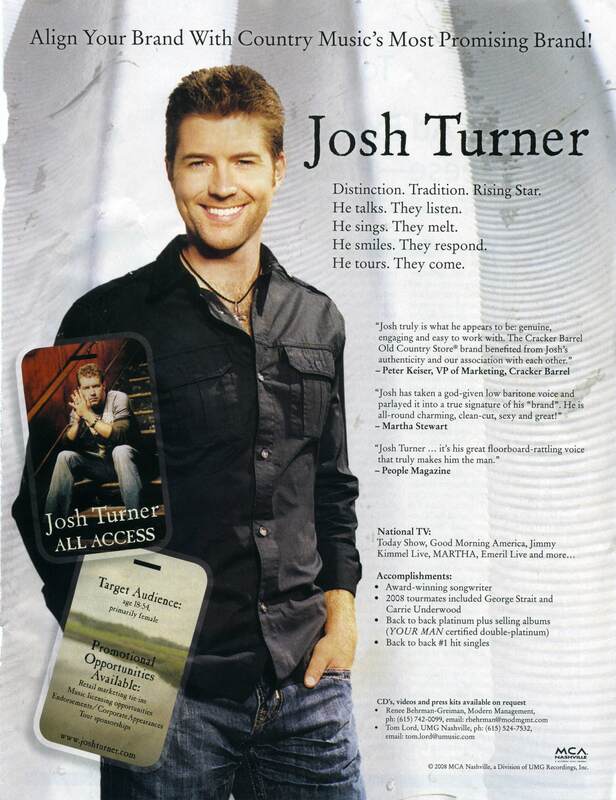 Although the text is too small to read, my point in posting it was show you that Josh Turner, his label, management, publishing company, etc (not sure who really paid) took out a full-page ad in an advertising and marketing trade publication. Josh is reaching out to partner with brands and at the same time calls himself a brand in the ad. Both are important and something covered a lot in the newsletter. Amazing effort by Josh and team!